The right sump pump is your best defense against basement flooding. When buying a sump pump, there are several features to consider. 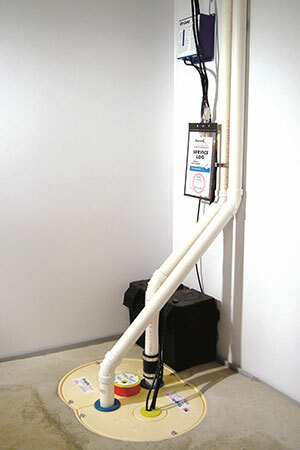 Basement Systems offers sump pump systems made with high-quality components and unique, built-in features designed to avoid failures and keep your basement dry all the time. 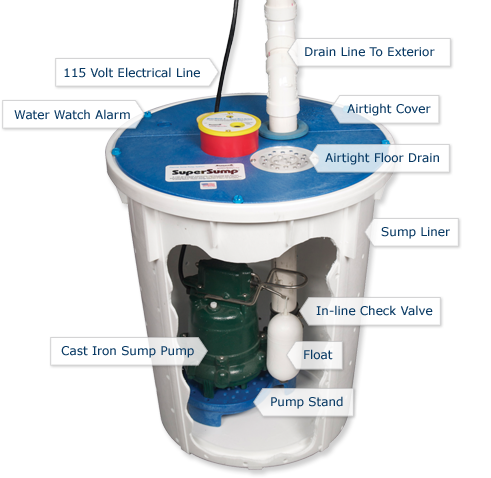 Click on the image to learn about the individual parts of our high-quality sump pump system. Top performance & excellent appearance. A sump pump system from Basement Systems incorporates top-quality components in an attractive & functional design. Sump liner. An open sump pit is hazardous, ugly and prone to clogging with debris. Our sump pump systems are housed in a durable plastic sump liner that includes an airtight lid. The finished installation fits flush with your basement floor. basement floor drain, in case standing water needs to drain into the sump liner. A battery-powered sump pump alarm is also built into the top. It will sound automatically if water level in the liner rises above the top of the pump. Zoeller sump pumps. The cast iron housings and powerful motors on our Zoeller pumps handle long run times and heavy pumping volume that overwhelm other pumps. These are the best pumps available. Reliable float switch. Unlike a “ball-on-wire” float switch that is prone to jamming or snagging, our linear-action float switch won’t malfunction. With our float switch, the sump pump will always “know” when to operate. specially-designed pedestal that prevents silt and small objects from clogging the intake. Check valve. Installed on the drain line, this one-way check valve prevents water from flowing back into the sump pit. Battery backup. We recommend installing a system that includes battery backup to keep your waterproofing system functioning during a power outage.